BMW are giving away a brand new BMW M5 on Facebook. Not! 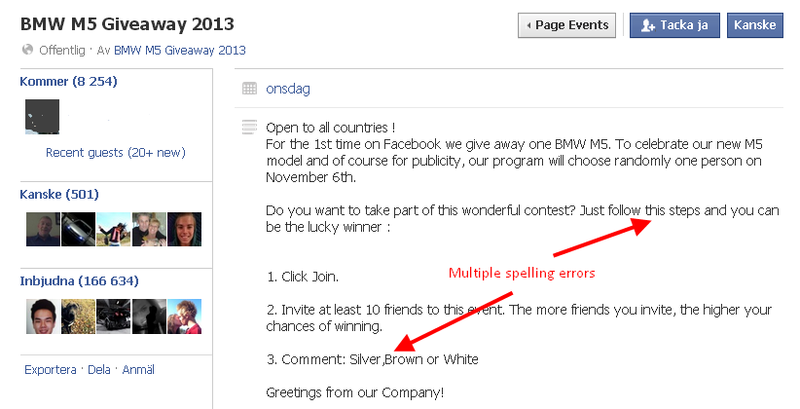 Do you think that BMW would give away a brand new car for free on Facebook through a simple “event”? Really? Of course they aren’t. If they would create a giveaway, it would be done professionally in a way that would maximize the return of the investment. Yet, thousands of people think that the simplest of hoaxes is the real deal and gladly accept invitations to a Facebook event, thinking they might actually win a new BMW M5. 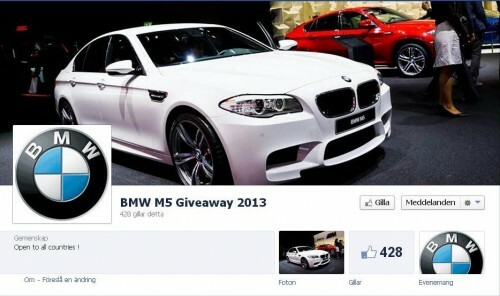 A new community page is attracting thousands of people to a “BMW M5 Giveaway 2013” (edit: link no longer works) who are encouraged to like the page and invite ten friends. More than 200,000 people have been invited so far. And without any doubt, this is a hoax from start to finish. So if you care at all whether you are tricked into liking fake pages on social networks, maybe it is time you learn a few basic tricks on how to spot a fake Facebook competition of giveaway. It really doesn’t take a genius. First of all, is it reasonable that a large brand is giving away something really valueable for just a few likes in return? Probably not. The more “upscale” brand, the more quality we can expect in a marketing activity. This event could have been set up by a 10-year old. Brands use multiple channels to communicate. Is this contest or giveaway communicated on any other place on the web? On the brand webpage or the brand Facebook page? If not, it’s probably fake. Are you being asked to spam your friends with shares, likes or invites? Big brands try to play by the book. If you are asked to do something that could be considered spam or not following the guidelines of Facebook, it’s a hoax. Does the page have credible branding? The BMW giveaway is a community page. A brand would not use a community page to promote a new product. And as you see below, the page doesn’t have a branded vanity URL, which you would expect a big brand to use (click on the images to see larger version). Does the page have credible background information? If not, it’s not only a hoax, it’s a lazy hoax. Did the page just launch or has it communicated trustworthy information for some time? If it is new and the giveaway is the very first post, you should think again. Does the contest or giveaway have a professional touch? If there are several spelling errors in just a few paragraphs, it’s probably fake. Does the information change on the event page? Are there copies? For a brief second, this giveaway page pointed to a second, similar page called BMW M5 Gift, with the same purpose and it has already attracted hundreds of people who in turn have invited 20,000 others. Once they got the first scam going, this could go on forever. It’s amazing how easy it is to trick people into liking and sharing pages on social networks. We rarely take a minute to reflect on information that is shared by our friends, and that practice can be easily exploited. So in the future, think before you share. 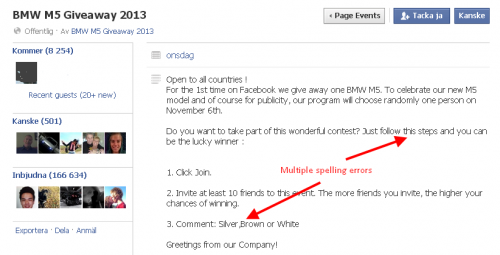 Update Nov 6: Both BMW pages and events are not gone from Facebook. But there are other similar scams that are still live, like this Audi R8 Giveaway. Also fake, of course. So when you see a fake give away, do you report it to Facebook? I reported this one. Are there people seriously responding to a fake giveaway on the page that is information about the fact that its a fake give away? OMG that is so funny.